School finance director Mark Friedman (center) said largest single spending item in $22 million high school budget is for post employment benefits. Breaking a stalemate over post-employment benefit funding and money for a new track, the regional high school district committee approved a $22 million operating budget to start the new year. The budget, which reflects a 5.79 per cent increase in spending over last year, was approved 6-2 with one abstention at a committee meeting on Wednesday evening. Town assessments, totaling approximately $19.6 million, will increase 6.35 per cent from last year. The committee set a tentative budget at a meeting on Dec. 18, but had to wait for the all-Island school committee to approve the superintendent’s office and shared services budget before finalizing the high school operating budget. The high school committee also received updated actuarial estimates from finance director Mark Friedman for the school’s contribution to their other post-employment benefit (OPEB) funds. On Wednesday, those issues came to the fore as committee members debated whether to show a commitment to the towns about funding the debt they assumed from the promised benefit packages. Even before the actuarial report, the tentative budget set aside approximately $838,000 in benefits saved for current employees, and more than $615,000 for retired teachers. To prevent the liability from growing, Mr. Friedman estimated the committee would have to allocate an extra $565,000 in this year’s budget. To completely fund the debt, he estimated that number at $1.6 million. “The single largest line-item increase in the budget is the OPEB,” Mr. Friedman told the committee. While some committee members feared sending a perpetually-increasing school budget on to the towns for approval, the desire to show a commitment to the debt ultimately prevailed at the meeting Wednesday. 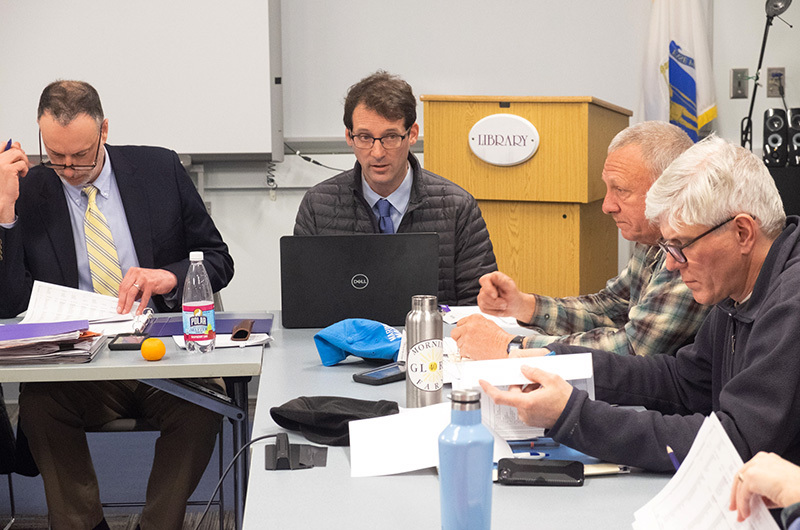 committee approved a motion from Jeffrey (Skipper) Manter 3rd of West Tisbury to add a $320,000 line item increase as part of a five-year funding plan. The motion passed 6-3, with Kris O’Brien, Catherine Shertzer, and Roxanne Ackerman dissenting. “I don’t think we can ignore this for this fiscal year,” Mr. Manter said. The committee then approved the final operating budget with a 6-2 vote, which will go to the towns for approval at annual town meetings this spring. At least three of the six towns need to sign off on the budget for it to pass. The budget also includes an additional $57,000 in transportation costs assessed to town elementary schools. The transportation measure was approved at the Dec. 18 meeting. Mr. Manter and Mr. Lionette dissented on the final budget vote, citing concerns about a $350,000 earmark for using so-call excess and deficiency funds to cover engineering and design work on the first phase of a high school track renovation project. The project to renovate the track is part of a larger athletic field overhaul estimated to cost $11.3 million. The first phase, which includes the track and football field, is estimated at $6.7 million. Mr. Manter said he felt the money would be better spent on the high school building feasibility study, estimated at $1.4 million. The feasibility study includes the initial costs of planning and design work on proposed high school building renovations. The committee voted 6-3 to approve a warrant article for town meetings in the spring that will request just over $1 million to be spread among the six towns for the renovation designs. Mr. Friedman said E and D funds from fiscal year 2018 and the inclusion of the superintendent’s office in the planning and design phase of the project will contribute about $300,000 to the overall cost. In an earlier meeting Wednesday, the all-Island school committee approved a $6.7 million superintendent and shared services operating budget, representing a 5.27 per cent increase over last year. The budget increase is tracked to salary and benefit increases. The superintendent’s budget covers a number of services shared among all Island schools, including special education, some music instruction and English Language Learner education. Although the original budget came in 7.1 per cent higher than last year, Vineyard schools superintendent Matthew D’Andrea said his office took considerable fat-trimming steps to keep the increase down. The committee approved the budget with a 9-2 vote.